A tornado watch is in effect for New York City today until 9 P.M. This means that isolated tornadoes could possibly develop as severe thunderstorms move through the area. 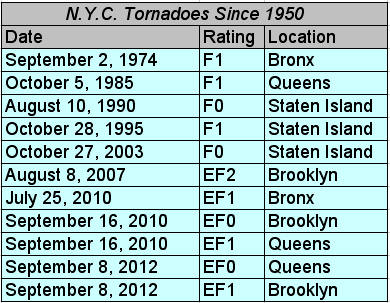 Tornadoes, historically, have been rare events in NYC. In recent years, however, they have been happening more frequently. Of the eleven twisters that have touched down in the city since 1950, seven have occurred in the past nine years. In fact, two roared through the boroughs of Brooklyn and Queens earlier this month. Many experts consider this increase in severe weather to be an indication of a changing climate. This entry was posted in weather and tagged nyc, storms, tornadoes by Melissa Fleming. Bookmark the permalink.